A. That's the ideal time to have this work done. Especially if someone in the house is highly sensitive to the smell of polyurethane, or perhaps someone is allergic to dust. But even if you are staying in your home, we can work out a schedule to fit your needs. A. Screening is buffing the floor with metal mesh disk before applying coat of finish. 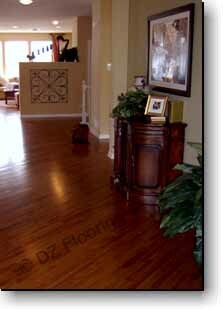 Unlike sanding, the floors are not sanded down to bare wood. Screening is done to prepare already finished floors to accept another coat of finish. Without Screening the finish would just peel off. It's primarily a Maintenance Tips. A. Screening can be done providing the floors never had wax applied to them. (wax includes pledge, endust, Murphy's oil ). Also screening will not get any dirt out of the pores of the wood. If you are down to the bare wood and dirt went into the cells of wood you will need to sand entire floor. Which is why the screen and re-coating is a great low-cost way to keep your floor looking brand new. A. Every job is unique. Contact us for more information or check our Price Calculator. Q. What's the difference between oil-base and water-base(latex)? A. Oil-based poly-urethanes contain solvents which can take a little longer to dry. The oil-base, which we believe is more durable and cost effective, provides the more "traditional warmer look". The makers of latex finishes are jumping leaps and bounds in making the product more durable, and we do have a growing number of customers that want the "lighter look" and who want to use it because it's more environmentally safe. So whichever finish suits your needs, we can work with you to maintain your wood floor so that it lasts a lifetime. A. Sure, Click here for some. A. We require a deposit of 50% down prior to beginning for sanding jobs. For installation jobs deposits are higher to cover costs of the flooring. We gladly accept Checks or Cash.